Docuware has partnered with DRS for over 20 years. Docuware technology has been deployed in 10,000+ installations and recently acquired the Westbrook Technology company and Fortis Software. Together with Docuware, DRS deploys advanced ECM solutions that scale using best in class architecture, technology, and security components. DRS Docuware solutions are flexible and allow users to grow from simple secure cloud-based document imaging repositories into advanced enterprise-wide workflow and ECM platform solutions. With DocuWare you can archive documents of every type and origin in the central document pool. Documents are indexed, i.e., provided with classification data when they are stored so that you can quickly find all of your information later. This classification data can be taken from select lists, for example, or simply assigned by clicking on the corresponding terms in the document. Additionally, DocuWare’s patent-pending Intelligent Indexing Service provides automatic indexing in document capture. Intelligent Indexing reads relevant index entries from the documents and suggests them for systematic storage. The service learns from you when you confirm or correct them. By the second or third time after you or a coworker has stored a similar document, Intelligent Indexing automatically assigns all entries correctly. Whether as a cloud or on-premise solutions, DocuWare offers all the elements needed for a powerful Enterprise Content Management solution. DocuWare Cloud provides the full feature set. DocuWare on-premise can be enhanced with flexible modules. Let DRS up and running with Free DocuWare Cloud trial with the complete software suite. Paper-based processes hold your employees and organization back from accomplishing bigger things. Going paperless has a greater impact on your larger business ecosystem than ever before. When paper-based processes are transformed into digital workflows, you will see improved operational efficiency and higher profitability. 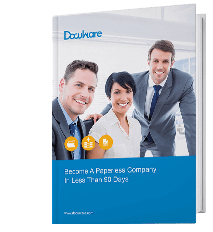 In this guide, you will get a step-by-step approach (implemented by 14,000+ businesses) for creating paperless processes.